but when I do, it's usually on the weekends. I mentioned in my last ops session report that one of the things such sessions are great for is seeing what you need to fix/address on your layout. Hopefully, over time, those lists of "to dos" will get smaller and smaller. I don't think they ever totally go away - there's always something to do. 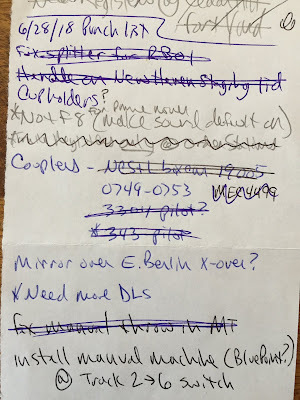 And if the layout's been dormant for a bit, the lists can get fairly long . . . 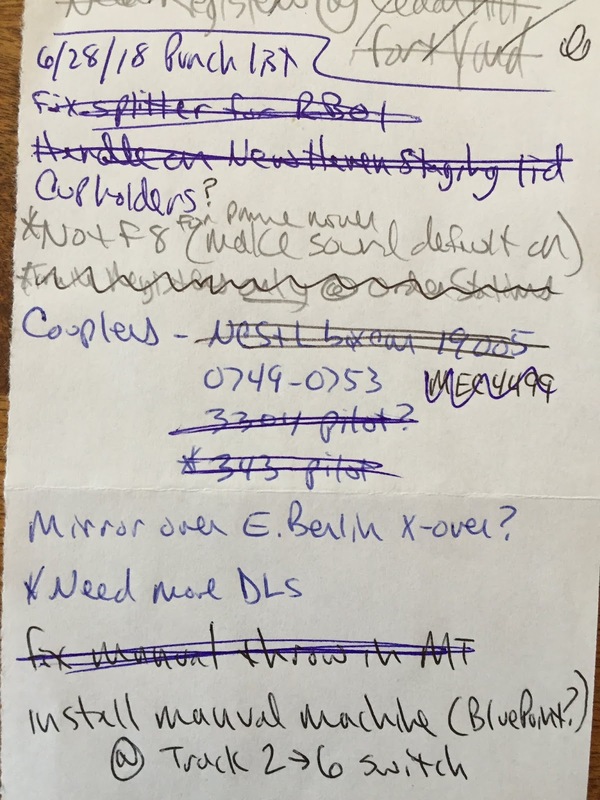 This is my fairly-typical list of things to do - some coupler issues, some programming issues, and a couple misc suggestions. 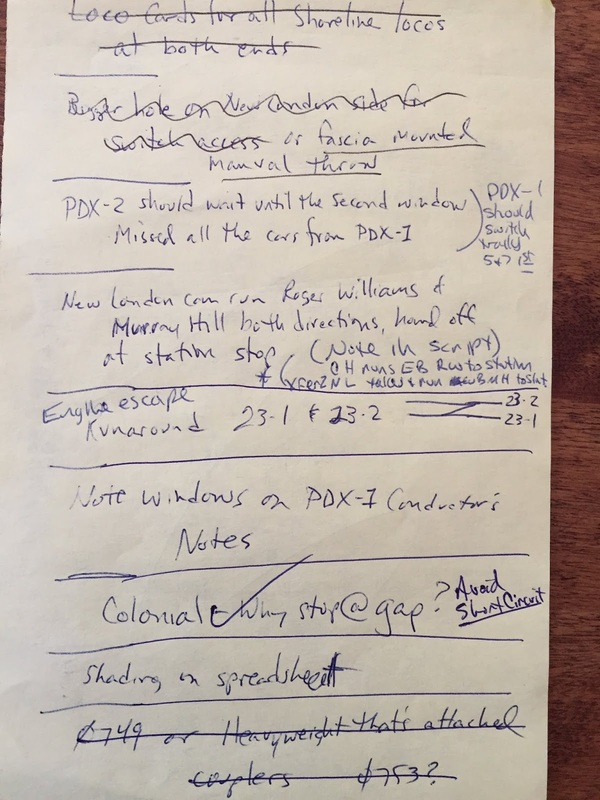 Speaking of suggestions, here's a list from one of my regular crew members, Randy. Beware of asking your crewmembers for Punch List items. They may just provide you with a few! 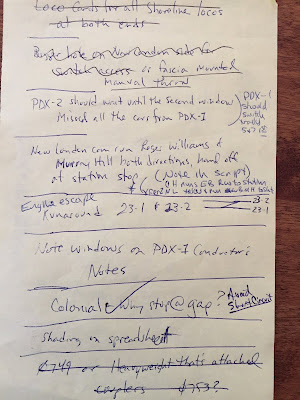 As you can see, I've already knocked a few things off these lists - either by actually doing them, or - in the case of a few on Randy's list - moving them from one list to another. The first thing I did was something that wasn't suggested by anybody, but I think will come in "handy" for the New Haven/Points West staging operator/mole. (sorry - couldn't resist the pun). For too long, I've been opening the staging box by grabbing that splice with my fingers. I'm actually a little embarrassed that it's taken me til now to just put a cheap little handle there. Much easier! Next, I tackled the radio antenna/Berlin Branch plug-in issue I mentioned in my last ops report. I'd started having a lot of problems with the radio throttles losing connection and I discovered the problem was that the cab bus splitter I'd installed was being weighed down by the bus itself and losing contact in the socket. So, for this past session, I just cut out the Berlin Branch part of the cab bus and plugged the antenna in directly. The solution (short of buying/trying additional splitters) was to just prop up the splitter . . .
Found a scrap piece from cutting the "lips" off my AC Moore bill boxes (I don't throw ANYthing away), moved it up against the splitter, and clamped it in place. Not all that elegant or pretty - and probably not a permanent solution - but problem certainly solved for now. Another thing I noticed after this past session - though unreported by anyone that I recall - is that the long manual turnout throw in the Middletown Yard broke, a little bit. I'd tried bending loops to keep everything connected, but it was especially hard to do so working under the benchwork - and trying not to break anything in the process. So, I'd just soldered a piece of wire onto the actuating wire to act as a "bumper/guide" to keep the push rod from sliding toward the fulcrum. It was that little piece of soldered-on wire which finally broke off. Yup - just a plain ol' clothespin, clamped onto the actuating rod. It keeps the push rod from sliding around and is just the right width. I'd considered using an alligator clip to do the same thing, but I found the clothespin first. And I have a lot more clothespins than I do alligator clips. . .
And now I'm in loco maintenance hell. If any of you have had the same experience with these engines (Proto 1000 DL-109s) and have a solution, please let me know. In the meantime, I may try to grind away some of the frame to raise the coupler. Fortunately, I don't have that far to go. Unfortunately, it's enough that not fixing it ensures that I'll lose my train from time-to-time. Like the Yankee Clipper. Which would be embarrassing. Especially during an open house. Ask me how I know. But all in all, none of these punch list items are all that difficult. They just take a bit of time. Sure - it's time I'd rather be spending doing something else on the layout, but as I keep saying - like bubbles on a newly-poured resin pond, eventually they'll all be popped and when they are we can experience the joy that comes from operating a layout that performs flawlessly and maintains the illusion of that time machine many of us strive for. Don't have a DL-109. They're not a west coast engine. But ... a guy in our club laser cut some shims out of a slippery paper that helps to level drooping couplers. Vinyl or styrene would probably work. It's sized to fit in the bottom of the box. Long-shank couplers display the problem because they have a longer lever arm. Thanks much for stopping by and taking the time to leave a comment!